World-famous chef Tom Colicchio's main culinary objective is to have his dishes prepared with the finest ingredients from small family farms and other specialized venues, to create an award-winning menu to please. As a James Beard award-winning chef, Tom Colicchio is enthusiastic about creating dishes and menu items that appeal to fine food critics. He uses only the purest ingredients and a philosophy, that is simplistic in nature, to make each dish burst with flavor. His dishes offer a variety of fares including Kobe beef, veal, salmon, and lobster dishes. 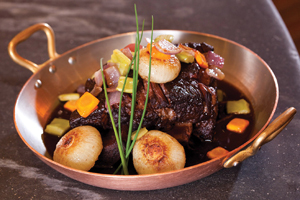 Some of Tom's famous cuisines include the lobster bisque, braised short ribs and grilled Kobe skirt steak. The wine list at Craftsteak is quite impressive and sure to please the discriminating wine connoisseur. Craft Steak is also described as a very tastefully hip place to dine because of the old Vegas feel with the modernization of the MGM Grand. The restaurant is a great place for an upscale meal while still feeling comfortable in the dining environment you occupy. Tom Colicchio truly turns your dining dreams into reality.